A few weeks ago, I hit the jackpot at Purple Crow Books in Hillsborough — hardback thrillers on sale for $5 each!! So, I immediately snatched some up. 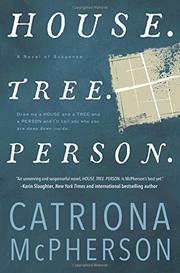 The first one I read turned out to be written by a Scottish author, Catriona McPherson. House. Tree. Person. is an unusual thriller, set partially in a grubby flat near the ruins of an abbey where monks had been buried years before. Ali and her husband Marco were forced to downgrade from their spacious home to the flat due to money problems. Their teenage son, Angelo, seems ambivalent, although he likes to spend time hanging out at the ruins for some reason. The story gets interesting when a body is discovered at the ruins, and Angelo gets caught up in the murder investigation. At the same time, Ali fakes her way into a well-paid beautician job at a mental health institution located on nearby military training grounds. From day one, the place feels weird to Ali — a young woman keeps claiming to have murdered her own father. A bedridden woman, Sylivie, appears catatonic but responds to Ali’s gentle massages and manicures. Meanwhile, Ali must hold it together while the police question her son and flashbacks of a traumatic past threaten her sanity! I really like the dark, moody atmosphere McPherson sets up — the ruins of the abbey in the background and the foreboding military grounds with days when staff and patients aren’t allowed to wander, due to practice shots and explosions. I love Ali’s interactions with the patients, the kind way she suggests fixes for their skin and problems; she’s very believable, and her character comes alive the most during these scenes. At times, the dialogue felt a little “clunky” and even a bit forced; mainly this happened with interactions between Ali and her oddly unpleasant boss, Dr. Ferris. I think the Dr. Ferris character could be fleshed out a bit more. Also, the end felt a little rushed and slightly convoluted, with Ali dashing outside at times and then running into characters in hallways. But, overall, I enjoyed the novel and would recommend it to those who like a good mystery – it’s darker than a typical “cozy” and makes for a satisfying read! Next postSo, you majored in English… Now what?